Fasting Before and After Purim. Aside from the much-mooted question whether Purim is of Jewish or of heathen origin, it is certain that, as it appears in the Book of Esther, the festival is altogether devoid of religious spirit—an anomaly in Jewish religious history. This is due to the worldly spirit of the Book of Esther. The only religious allusions therein are the mention of fasting in iv. 16 and ix. 31, and perhaps the expression of confidence in the deliverance of Israel in iv. 14. This secular character has on the whole been most prominent in this festival at all times. Like Ḥanukkah, it has never been universally considered a religious holy day, in spite of the fact that it is designated by the term "yom-ṭob" (Esth. ix. 19, 22.). Accordingly business transactions and even manual labor are allowed on Purim, although in certain places restrictions have beenimposed on work (Shulḥan 'Aruk, Oraḥ Ḥayyim, 696). Nevertheless Purim has been held in high esteem at all times and in all countries, some even maintaining that when all the prophetical and hagiographical works shall be forgotten the Book of Esther will still be remembered, and, accordingly, the Feast of Purim will continue to be observed (Yer. Meg. i. 5a; Maimonides, "Yad," Megillah, iii. 18; comp. Schudt, "Jüdische Merkwürdigkeiten," ii. 311). It is also claimed that Purim is as great as the day on which the Torah was given on Sinai ("Mordekai" on B. M. ix., end; comp. Lampronti, "Paḥad Yiẓḥaḳ," s.v. "Purim"). 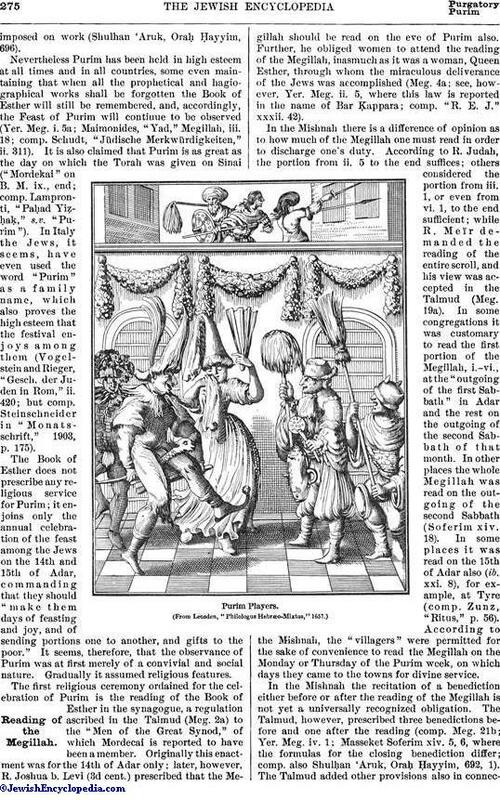 In Italy the Jews, it seems, have even used the word "Purim" as a family name, which also proves the high esteem that the festival enjoys among them (Vogelstein and Rieger, "Gesch. der Juden in Rom," ii. 420; but comp. Steinschneider in "Monatsschrift," 1903, p. 175). The first religious ceremony ordained for the celebration of Purim is the reading of the Book of Esther in the synagogue, a regulation ascribed in the Talmud (Meg. 2a) to the "Men of the Great Synod," of which Mordecai is reported to have been a member. Originally this enactment was for the 14th of Adar only; later, however, R. Joshua b. Levi (3d cent.) prescribed that the Megillah should be read on the eve of Purim also. Further, he obliged women to attend the reading of the Megillah, inasmuch as it was a woman, Queen Esther, through whom the miraculous deliverance of the Jews was accomplished (Meg. 4a; see, however, Yer. Meg. ii. 5, where this law is reported in the name of Bar Ḳappara; comp. "R. E. J." xxxii. 42). In the Mishnah there is a difference of opinion as to how much of the Megillalh one must read in order to discharge one's duty. According to R. Judah, the portion from ii. 5 to the end suffices; others considered the portion from iii. 1, or even from vi. 1, to the end sufficient; while R. Meïr demanded the reading of the entire scroll, and his view was accepted in the Talmud (Meg. 19a). In some congregations it was customary to read the first portion of the Megillah, i.-vi., at the "outgoing of the first Sabbath" in Adar and the rest on the outgoing of the second Sabbath of that month. In other places the whole Megillah was read on the outgoing of the second Sabbath (Soferim xiv. 18). In some places it was read on the 15th of Adar also (ib. xxi. 8), for example, at Tyre (comp. Zunz, "Ritus", p. 56). According to the Mishnah, the "villagers" were permitted for the sake of convenience to read the Megillah on the Monday or Thursday of the Purim week, on which days they came to the towns for divine service. In the Mishnah the recitation of a benediction either before or after the reading of the Megillah is not yet a universally recognized obligation. The Talmud, however, prescribed three benedictions before and one after the reading (comp. Meg. 21b; Yer. Meg. iv. 1; Masseket Soferim xiv. 5, 6, where the formulas for the closing benediction differ; comp. also Shulḥan 'Aruk, Oraḥ Ḥayyim, 692, 1). The Talmud added other provisions also in connectionwith the reading of the Megillah. For example, the reader was to pronounce the names of the ten sons of Haman (Esth. ix. 7-10) in one breath, to indicate their simultaneous death (Meg. 16b; Oraḥ Ḥayyim, 690, 15). The congregation was to recite aloud with the reader the verses ii. 5, viii. 15-16, and x. 3, which relate the origin of Mordecai and his triumph (Abudarham, ed. Amsterdam, 1726, p. 76; Oraḥ Ḥayyim, l.c.). This rule is of geonic origin (see Brück, "Pharisaische Volkssitten," p. 158). Saadia Gaon demanded that only the first two verses of the four mentioned above be read aloud; and this was the custom in Spain (Abudarham, l.c.). "Haman Klopfers" Used on Purim Feast by Jewish Children of Russia. The Megillah is read with a traditional chant differing from that used in the reading of the pericopes or the Pentateuch. In some places, however, it is not chanted, but is read like a letter, because of the name "iggeret" (epistle) which is applied (Esth. ix. 26, 29) to the Book of Esther (comp. Judah 'Ayyash, "Bet Yehudah," No. 23, Leghorn, 1747). For the same reason it has been also customary since the time of the Geonim to unroll the whole Megillah before reading it, in order to give it the appearance of an epistle (Oraḥ Ḥayyim, 690, 17; comp. Brück, l.c. p. 159). Finally, it is to be mentioned that the Megillah may be read in any language intelligible to the audience. In Hebrew and also in Greek it may be read even when not understood (Meg. 18a; Oraḥ Ḥayyim, 690, 8-12; see, however, Soferim xxi. 8, where it is said that all Israel is in duty bound to read the Megillah in Hebrew). In Saragossa the Megillah was read in Spanish, a practise against which Isaac ben Sheshet (Responsa, Nos. 388-391) and Nissim Gerondi protested (see Grätz, "Gesch." viii. 35; Abrahams, "Jewish Life in the Middle Ages," pp. 345 et seq. ; Steinschneider, in "Monatsschrift," 1903, p. 178). Talking during the public recitation was prohibited (Oraḥ Ḥayyim, 692, 2). According to the Mishnah (Meg. 30b), In addition to the Megillah Ex. xvii. 8-16, the story of the attack on the Jews by Amalek, the progenitor of Haman, is to be read. Purim gave rise to many religious compositions, some of which were incorporated into the liturgy. For the large number of hymns intended for the public service as well as other writings (dramas, plays, etc.) 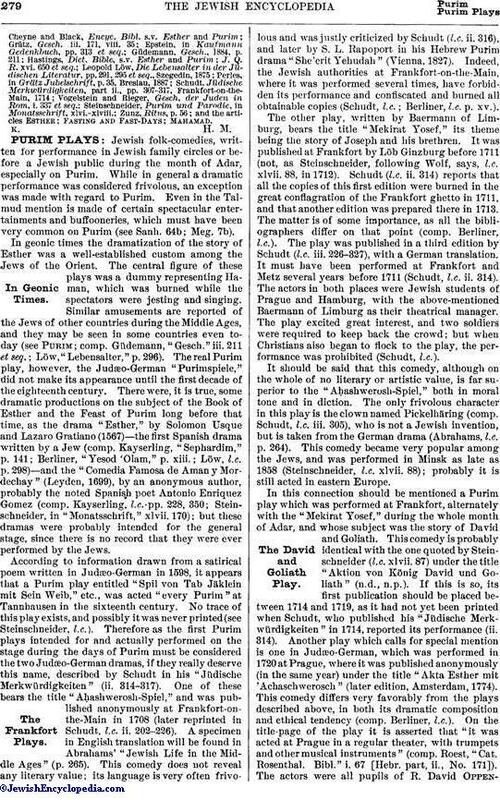 intended for general edification, both in Hebrew and in other languages, see the exhaustive study by M. Steinschneider, "Purim und Parodie," in "Monatsschrift," xlvi.-xlviii., Index, especially xlvi. 279 et seq., 372 et seq. ; for Karaitic rites see ib. pp. 373 et seq. 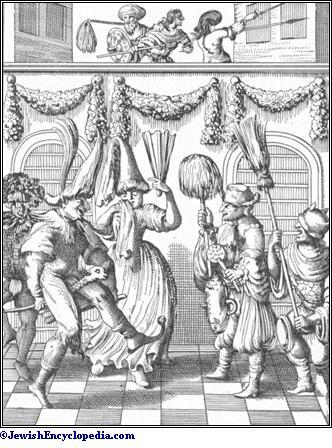 Purim Players at Prague, Early Eighteenth Century. The national rather than the religious character of the festival made it appear appropriate to celebratethe occasion by feasting. Hence it was the rule to have at least one festive meal, called "se'udat Purim," toward the evening of the 14th (Meg. 7b; Oraḥ Ḥayyim, 695, 1). In this connection it may be mentioned that for the celebration of Purim there developed among the Jews a special kind of baking. Cakes were shaped into certain forms and were given names having some symbolic bearing on the historical events of Purim. Thus the Jews of Germany eat " Hamantaschen" and "Hamanohren" (in Italy, "orrechi d'Aman"), "Kreppchen," "Kindchen," etc. (comp. Steinschneider, l.c. xlvii. 177, 360 et seq.). The jovial character of the feast was forcibly illustrated in the saying of the Talmud (Meg. 7b) that one should drink on Purim until he can no longer distinguish "Cursed be Haman" from "Blessed be Mordecai," a saying which was codified in the Shulḥan 'Aruk (ib. ), but which was later ingeniously explained as referring to the letters occurring in the sentences and , in each of which the numerical value of the letters amounts to 502 (comp. Abudarham, l.c. ; Lewin, "Gesch. der Juden in Lissa," p. 212, Pinne, 1904). While the Jews have always been noted for abstemiousness in the use of intoxicants, drunkenness was licensed, so to speak, on Purim, to comply with the command which seemed to lie in the Biblical term "mishteh" (drink) applied to Purim (Abudarham, l.c.). It is, therefore, not surprising that all kinds of merry-making, often verging on frivolity, have been indulged in on Purim, so that among the masses it has become almost a general rule that "on Purim everything is allowed" (comp. Steinschneider, l.c. p. 186), even transgressions of a Biblical law, such as the appearance of men in women's attire and vice versa, which is strictly prohibited in Deut. xxii. 5. This went so far that if through exuberance of spirits a man inflicted damage on the property of another on Purim he was not compelled to repair it (Oraḥ Ḥayyim, l.c., and the references there given). 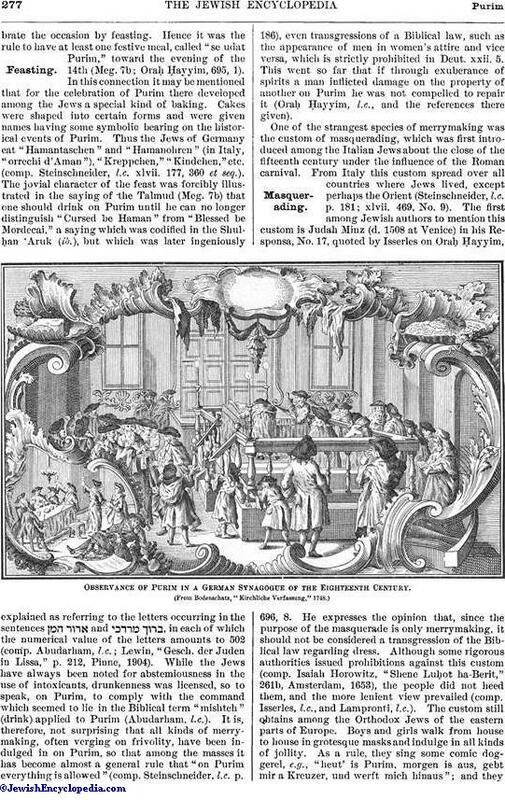 Observance of Purim in a German Synagogue of the Eighteenth Century. One of the strangest species of merrymaking was the custom of masquerading, which was first introduced among the Italian Jews about the close of the fifteenth century under the influence of the Roman carnival. From Italy this custom spread over all countries where Jews lived, except perhaps the Orient (Steinschneider, l.c. p. 181; xlvii. 469, No. 9). The first among Jewish authors to mention this custom is Judah Minz (d. 1508 at Venice) in his Responsa, No. 17, quoted by Isserles on Oraḥ Ḥayyim, 696, 8. He expresses the opinion that, since the purpose of the masquerade is only merrymaking, it should not be considered a transgression of the Biblical law regarding dress. Although some rigorous authorities issued prohibitions against this custom (comp. Isaiah Horowitz, "Shene Luḥot ha-Berit," 261b, Amsterdam, 1653), the people did not heed them, and the more lenient view prevailed (comp. Isserles, l.c., and Lampronti, l.c.). The custom still obtains among the Orthodox Jews of the eastern parts of Europe. Boys and girls walk from house to house in grotesque masks and indulge in all kinds of jollity. As a rule, they sing some comic doggerel, e.g., "heut' is Purim, morgen is aus, gebt mir a Kreuzer, und werft mich hinaus"; and theyare often given a few coins (comp. Steinschneider, l.c. xlvi. 176, 182). Purim songs have even been introduced into the synagogue. For the children's sake certain verses from the Book of Esther have been sung in chorus on Purim (Abrahams, l.c. p. 33). 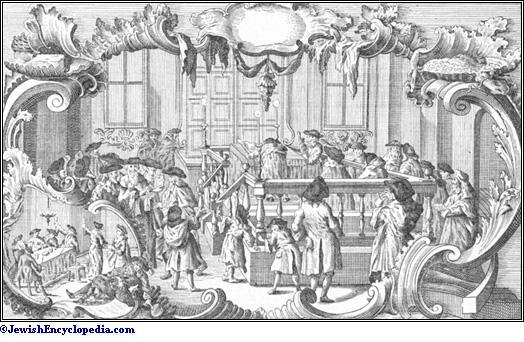 Indeed, Purim was an occasion on which much joyous license was permitted even within the walls of the synagogue itself. 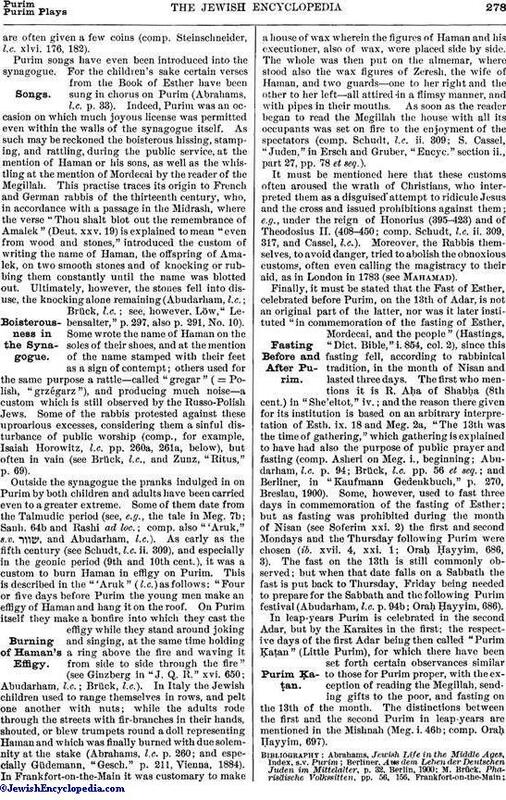 As such may be reckoned the boisterous hissing, stamping, and rattling, during the public service, at the mention of Haman or his sons, as well as the whistling at the mention of Mordecai by the reader of the Megillah. This practise traces its origin to French and German rabbis of the thirteenth century, who, in accordance with a passage in the Midrash, where the verse "Thou shalt blot out the remembrance of Amalek" (Deut. xxv. 19) is explained to mean "even from wood and stones," introduced the custom of writing the name of Haman, the offspring of Amalek, on two smooth stones and of knocking or rubbing them constantly until the name was blotted out. Ultimately, however, the stones fell into disuse, the knocking alone remaining (Abudarham, l.c. ; Brück, l.c. ; see, however, Löw,"Lebensalter," p. 297, also p. 291, No. 10). Some wrote the name of Haman on the soles of their shoes, and at the mention of the name stamped with their feet as a sign of contempt; others used for the same purpose a rattle—called "gregar" (= Polish, "grzégarz"), and producing much noise—a custom which is still observed by the Russo-Polish Jews. Some of the rabbis protested against these uproarious excesses, considering them a sinful disturbance of public worship (comp., for example, Isaiah Horowitz, l.c. pp. 260a, 261a, below), but often in vain (see Brück, l.c., and Zunz, "Ritus," P. 69). Outside the synagogue the pranks indulged in on Purim by both children and adults have been carried even to a greater extreme. Some of them date from the Talmudic period (see, e.g., the tale in Meg. 7b; Sanh. 64b and Rashi ad loc. ; comp. also "'Aruk," s.v. and Abudarham, l.c.). As early as the fifth century (see Schudt, l.c. ii. 309), and especially in the geonic period (9th and 10th cent. ), it was a custom to burn Haman in effigy on Purim. This is described in the "'Arnk" (l.c.) 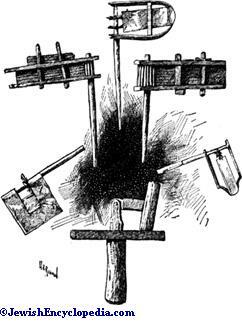 as follows: "Four or five days before Purim the young men make an effigy of Haman and hang it on the roof. 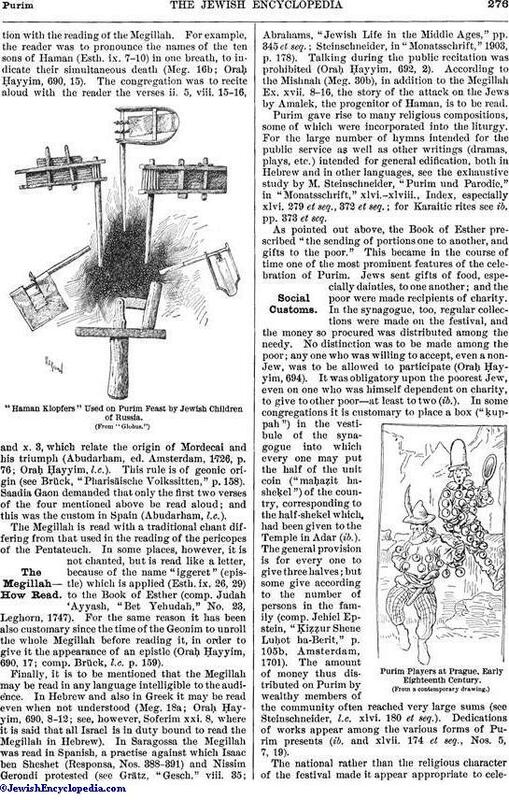 On Purim itself they make a bonfire into which they cast the effigy while they stand around joking and singing, at the same time holding a ring above the fire and waving it from side to side through the fire" (see Ginzberg in "J. Q. R." xvi. 650; Abudarham, l.c. ; Brück, l.c.). In Italy the Jewish children used to range themselves in rows, and pelt one another with nuts; while the adults rode through the streets with fir-branches in their hands, shouted, or blew trumpets round a doll representing Haman and which was finally burned with due solemnity at the stake (Abrahams, l.c. p. 260; and especially Güdemann, "Gesch." p. 211, Vienna, 1884). In Frankfort-on-the-Main it was customary to make a house of wax wherein the figures of Haman and his executioner, also of wax, were placed side by side. The whole was then put on the almemar, where stood also the wax figures of Zeresh, the wife of Haman, and two guards—one to her right and the other to her left—all attired in a flimsy manner, and with pipes in their mouths. As soon as the reader began to read the Megillah the house with all its occupants was set on fire to the enjoyment of the spectators (comp. Schudt, l.c. ii. 309; S. Cassel, "Juden," in Ersch and Gruber, "Encyc." section ii., part 27, pp. 78 et seq.). It must be mentioned here that these customs often aroused the wrath of Christians, who interpreted them as a disguised attempt to ridicule Jesus and the cross and issued prohibitions against them; e.g., under the reign of Honorius (395-423) and of Theodosius II. (408-450; comp. Schudt, l.c. ii. 309, 317, and Cassel, l.c.). Moreover, the Rabbis themselves, to avoid danger, tried to abolish the obnoxious customs, often even calling the magistracy to their aid, as in London in 1783 (see Mahamad). Finally, it must be stated that the Fast of Esther, celebrated before Purim, on the 13th of Adar, is not an original part of the latter, nor was it later instituted "in commemoration of the fasting of Esther, Mordecai, and the people" (Hastings, "Dict. Bible, " i. 854, col. 2), since this fasting fell, according to rabbinical tradition, in the month of Nisan and lasted three days. The first who mentions it is R. Aḥa of Shabḥa (8th cent.) in "She'eltot," iv. ; and the reason there given for its institution is based on an arbitrary interpretation of Esth. ix. 18 and Meg. 2a, "The 13th was the time of gathering," which gathering is explained to have had also the purpose of public prayer and fasting (comp. Asheri on Meg. i., beginning; Abudarham, l.c. p. 94; Brück, l.c. pp. 56 et seq. ; and Berliner, in "Kaufmann Gedenkbuch," p. 270, Breslau, 1900). Some, however, used to fast three days in commemoration of the fasting of Esther; but as fasting was prohibited during the month of Nisan (see Soferim xxi. 2) the first and second Mondays and the Thursday following Purim were chosen (ib. xvii. 4, xxi. 1; Oraḥ Ḥayyim, 686, 3). The fast on the 13th is still commonly observed; but when that date falls on a Sabbath the fast is put back to Thursday, Friday being needed to prepare for the Sabbath and the following Purim festival (Abudarham, l.c. p. 94b; Oraḥ Ḥayyim, 686). 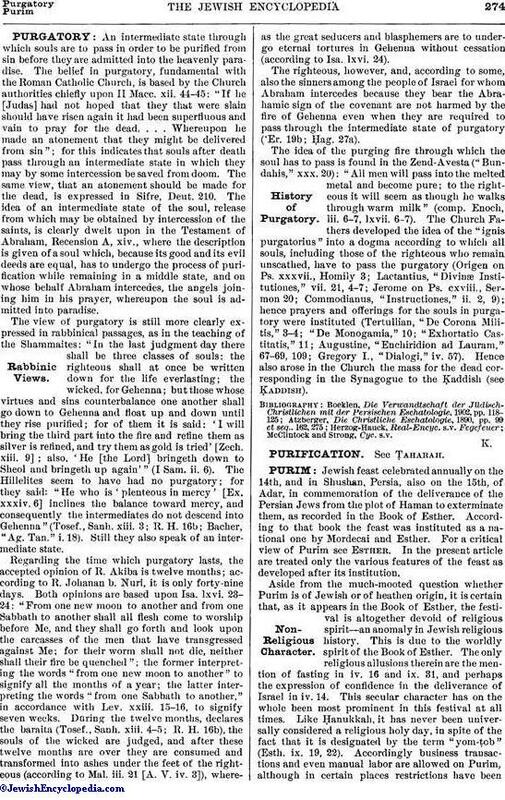 In leap-years Purim is celebrated in the second Adar, but by the Karaites in the first; the respective days of the first Adar being then called "Purim Ḳaṭan" (Little Purim), for which there have been set forth certain observances similar to those for Purim proper, with the exception of reading the Megillah, sending gifts to the poor, and fasting on the 13th of the month. The distinctions between the first and the second Purim in leap-years are mentioned in the Mishnah (Meg. i. 46b; comp. Oraḥ Ḥayyim, 697). and the articles Esther; Fasting and Fast-Days; Mahamad.